When most people think of sunny Orlando Florida, they think of the many theme parks like Walt Disneyworld and Universal Studios. They picture families with young children riding the rides at Suesssville in Disneyworld or families with older kids enjoying the Wizarding World of Harry Potter and Diagon Alley in Universal Studios. The truth of the matter is that Orlando is a huge draw for companies having large corporate events. Companies have been having corporate events in Orlando for decades now. The attendees can be at the required events when necessary and still have the time to relax and enjoy the many attractions the area has to offer in their downtime. Corporate shuttle services can make transportation a snap in Orlando. The luxurious minibus offered by Luxury Transportation Group USA provides the comfort and reliability companies want for their employees in need of corporate transportation services in the Orlando area. One of the biggest issues that occur with company events in Orlando is getting the attendees to and from the venues at the correct times. For years, company event planners have complained that people show up late and mysteriously disappear earlier than they should. These issues can easily be avoided when corporate shuttle transportation is provided for the attendees. The company can inform the attendees of when they will be picked up in the minibus from the corporate transportation services company. This will ensure that no one is late for the events planned for the day. Companies can also book corporate shuttle services for other outings in Orlando, such as visiting theme parks, company dinners, or golf outings. Luxury Transportation Group USA offers the widest variety of shuttle services Orlando has to offer. When it comes to shuttle services Orlando has little to offer unless your attendees are staying at a hotel and the events are at a venue the hotel shuttle goes to. Keep in mind that there are a few hotels with shuttlebuses that go to traditional conventional halls however; they are in no way corporate shuttle services. Your employees and attendees deserve high quality, luxury corporate transportation services. Luxury Transportation Group USA is the premiere provider of corporate shuttle services Orlando has to offer. 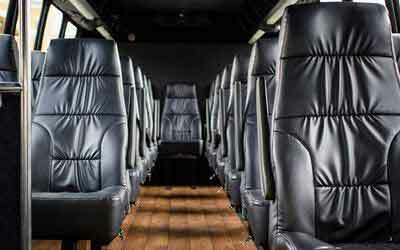 Luxury Transportation Group USA is the go to transportation services company for many large scale companies in need of corporate shuttle services in Orlando. With the widest selection of shuttle services Orlando has to offer, it’s a no brainer that Luxury Transportation Group USA is the company to call. Remember to book your transportation services early as Orlando corporate transportation services vehicles go quickly during peak periods.